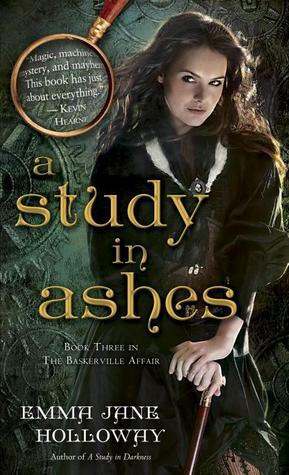 It’s been a rollercoaster of a ride with Evalina Cooper and the Baskerville Rebellion, and after a much improved outing with A Study in Darkness, I had high hopes for A Study in Ashes. We jump forward a year from where we left Evalina. Enrolled in college, leashed by the Gold King, she’s still grieving for Nick and Imogen. Tobias has mostly settled into his role as maker for Keating and is surprised to find he adores his son. The rebellion’s coming to a head. The Steam Council is falling apart. There’s a lot of ground to cover and a lot of strings to tie up in A Study in Ashes. That’s what made this book a disappointment. There were parts I enjoyed. I loved how the women of Ashes didn’t wait around to be rescued – Evalina and Imogen often found themselves in situations they managed to get themselves out of. Despite their separation, their friendship is as strong as ever. Poppy is treated as the maturing young lady she is, and I especially liked how Holmes took her seriously, even with his reservations about magic. I was rooting for Nick and Evie to find their happy ever after (and I may have a bit of a crush on the pirate captain). The story’s biggest flaw, though, is its length. Because of its multiple points of view, resulting in numerous subplots, there’s far too much to tie up in one book, even though the ending leaves room for more. The pace is quick and tight up until about halfway through, when events take an unexpected, and unnecessary, turn, dragging the second half of the book way down. I struggled to finish it, frankly, which is why I ended up giving Ashes such a low rating. It would have been a much stronger book had it been shorter. The battle against the Steam Council ultimately takes place over a short period of time, yet drags on. Evalina doesn’t appear on the page for about half of the last half of the book, and Imogen is almost an afterthought by this point. I like Evalina and would have been interested in reading more of her adventures. But the conclusion of the Baskerville Rebellion was such a letdown, I’ll be hard pressed to want to read anything more. I love the idea of the series but I tried to read A Study in Silks and could not get past the first few pages. I guess, I’m at least glad to hear that I did not miss out on much. There were parts of it that made it worth reading, and fortunately those parts were strong enough to push me through the spots that dragged. But I agree, it wasn’t quite what I’d hoped for.